The varsity track and field team recorded a number of individual achievements this spring, with athletes setting school records and competing in the New Jersey State Group Championships and the Meet of Champions. At the opening meet of the season against Bernards High on April 5, the boys’ squad had three first-place finishes, with Mathieu Petit '17 taking first in the 800, Greg Niccolai '16 claiming first in both discus and javelin and second in shot put, and C.J. Licata '18 earning first in shot put and second in discus and javelin. For the girls, Ludi Zhu '16 claimed first in the 100 and in the long jump, Nicole Johnson '18 garnered first in the 800, and Sahara Ensley '16 took first in the 3200. Erica Phiansunthon '17 took first in javelin and shot put and second in discus, while Colette Bilynsky '16 took second in javelin and third in discus and shot put. On April 12, the team faced Bound Brook, Manville and South Hunterdon. On the girls’ squad, Zhu took first in both the long jump and triple jump, Phiansunthon claimed first in the shot put, and Ensley claimed second in the 1600. The 4x4 relay team of Alicia Amoroso '19, Ensley, Johnson and Zhu finished first. Notable finishes for the boys included Petit, who took first in the 1600 and second in the 800 and Felix Andersen '17 who took first in the 3200. In javelin, Niccolai placed first and Licata second. On April 19, the girls’ squad posted the top four times in the 1600 (Ensley in first, Johnson in second, Lillie Wilson ‘16 in third and Lily Fischer '19 in fourth), the top three finishes in the 800 (Johnson in first, Ensley in second and Amoroso in third) and the top two spots in the 3200 (Ensley in first and Johnson in second). For the boys, Andersen and Robert D'Angelo '18 claimed the top two spots in the 800, and Michael Iannaconi '16 and Petit finished first and second in the 3200. 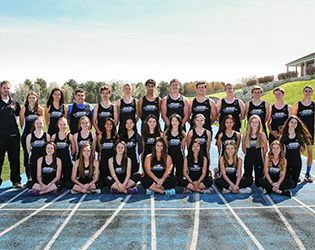 The team closed out April at the Millburn Relays, with both the boys' and the girls' teams setting two school records. Claiming first in the discus and setting a GSB record were the duo of Niccolai (126'7") and Licata (120' 5"). The boys' 4x1600 relay team (Andersen, D'Angelo, Iannaconi and Petit) also took first and set a GSB record with a time of 18:54. For the girls, the freshman/ sophomore sprint medley relay team of Amoroso, Chloe Doherty '19, Fischer and Alyssa Jurewicz '19) took fourth, setting a GSB record with their time of 4:47. In the distance medley relay, the team of Ensley, Fischer, Jacqueline Roettger '16 and L. Wilson finished sixth, setting a GSB record with a time of 13:54. At the Prep B championships on May 23, Zhu took first in the long jump, second in the triple jump and third in the 100. For the boys’ squad, Licata claimed first in the shot put. The team closed out May at the South Jersey B Sectionals. Notable finishes included Johnson, who took first in the 800, D'Angelo who took third in the 3200 and Ensley who placed third in the 1600. The girls' 4x800 relay team (Ensley, Fischer, Johnson and L. Wilson) claimed second place and set a GSB record with 10:10.86. The boys’ 4x800 relay team (Andersen, D'Angelo, Iannaconi and Petit) took fourth place and set a GSB record with 8:42.51. In June at the State Group B Championships, Zhu took second in both the long jump and the triple jump. Petit finished third in the 800 and Johnson finished fourth. In the 3200, D'Angelo finished fourth. Several athletes qualified for the Meet of Champions on June 8: D'Angelo, Ensley, Fischer, Iannaconi, Johnson, Niccolai, Petit, Christopher Varghese '19, L. Wilson and Zhu. Looking ahead to next spring, it will be challenging to replace the talented senior lineup from this season. Among them, Ensley, Iannaconi, Niccolai, L. Wilson and Zhu qualified for the Meet of Champions, and Bilynsky, Luberto and Roettger were solid and consistent contributors. Among the rising seniors, the boys' team will look to Petit to lead the charge. The girls will look to Phiansunthon and rely more heavily on Sammy Bittman and Olivia Wilson. Four rising juniors return to the team next year. Among them, D'Angelo, Johnson and Licata made significant contributions this season and the team will look to greater contributions from Cynthia Hu. Boding well for the future of the program, 13 rising sophomores will return to the program: Amoroso, Emily Axelsen, Lilly Cannon, Doherty, Matthew D'Ovidio, Fischer, Mark Giordano, Jurewicz, Anja Kroon, Eve Ryan, Surbhi Srinivas, Varghese and A.J. Witte.